Photodynamic Therapy: What is It? You may already have heard about light therapy for skin such as: anti-aging, for acne and wrinkles. A somewhat similar therapy is photodynamic therapy, or PDT. Photodynamic therapy and other types of light therapy, such as blue light therapy, often get mixed up. So here we are going to answer the question: what is photodynamic therapy? Photodynamic therapy is a type of light therapy for skin treatment where a photosensitizer is first applied, making the skin much more reactive to the light that follows. This can be used for many different conditions. PDT is typically done by a physician. So what is PDT good for? Well, one condition it is sometimes used to treat is skin cancer. For example, in 2007 Braathen et al. described the use of photodynamic therapy as being a useful technique to treat some of non-melanoma skin cancers . This is very interesting, as the fundamental basis is the same as it is for low level light therapy (or LLLT) cosmetic treatments. You can see the effect I am talking about in the PDT before and after photos below. 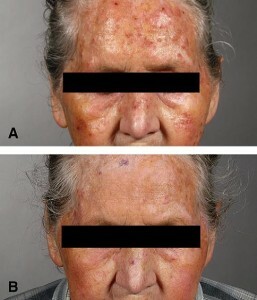 Effect of treatment described by Braathen et al. 2007, J Am Acad. Dermatol. AK lesion in field cancer-ridden area before (A) and after (B) PDT treatment. If you would like to learn more about the scientific side, click here to read the complete article. If you want see more red light therapy before and after photos, check out this page. Different dermatologists and also people that already tried light therapy post their comments and pictures there. What I can say is that PDT is a trusted, established medical technique. Its effects are scientifically demonstrated. Obviously, PDT should only be done by a qualified medical professional. Often, PDT gets confused with blue light therapy, which is a treatment that does not need to be administered by a doctor. Click here to read more about blue light therapy. This entry was posted in Other Light Therapy and tagged PDT, photodynamic therapy by Bambi. Bookmark the permalink.